Thick Eyebrows can take years off your face and enhance your look. Bold and thick eyebrows have become a rage now, and everyone – from catwalk models to red carpet divas – is sporting them with great gusto. Eyebrows are one of the most noticeable parts of one’s face; the thicker they are, more beautiful you look. But not all of us are fortunate enough to have thick eyebrows. Some of us have thin and sparse eyebrows that make them look older and dull. Those of us who have sparse and scanty eyebrows are always on the lookout for remedies to make them thicker. But most of the eyebrow products available in the market make them look drawn on, a.k.a fake. If you are scouting for effective remedies to make your eyebrows thicker naturally, this article is for you. Though there isn’t a magic tip to make your eyebrow thicker overnight, but there are certain things that you can do to speed up the process. How To Grow Your Eyebrows Thicker? 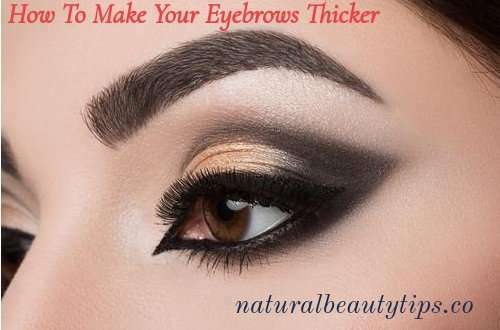 Read on to know how to get thick eyebrows naturally. These remedies will make your eyebrow hair stronger and thicker, and some of them will also help fresh hair growth. Before you embark upon using these remedies, let me share with you some facts about growing eyebrows. The normal growth rate of the eyebrow hairs is more or less 0.16mm per day. So, you have to be patient while trying the following natural home remedies. Note: If you want quicker results, you will need to use an eyebrows growth serum to help fastest growth. Please skip over to the end of this article for the list our editor’s choice three exclusive eyebrows growth serums. (i) Take a few drops of castor oil on your fingertips, and massage gently into your eyebrows with your fingertips for 2 to 3 minutes. (ii) Leave it on for at least 30 minutes or overnight. (iii) Wash it off with lukewarm water and a mild cleanser. (iv) To have fuller eyebrows in as less as six weeks, make sure you apply castor once daily. If you are allergic to pure castor oil, it may cause irritation, hives, and rashes. Make sure you do a patch test before using it. Don’t use it, if causes any irritation or burning. (i) Use organic, cold-pressed castor oil. (ii) Black castor oil is excellent for growing hair naturally. The eyebrows are made up of proteins. Coconut oil controls protein loss, so it makes your brows stronger (2). The lauric acid present in it acts as an antimicrobial agent, preventing infection of hair follicles. The fatty acids present in coconut oil work with the natural proteins found in hair to protect it from breaking. (i) Dip the cotton swab in the oil and apply it to your eyebrows. (ii) Use your fingertips to massage gently for a few minutes to boost blood circulation. (iii) Leave it on overnight. Rinse with warm water in the morning. (iv) Apply this remedy daily before you sleep at night. Olive oil is rich in vitamins A and E that can help your eyebrow hair grow faster and thicker. Vitamin E also nourishes each hair strand, which can help keep your eyebrows dark-hued. (i) Pour a drop of warm extra virgin olive oil on your fingertip and gently massage it on your eyebrows for 2-3 minutes before going to bed. Let it stay on for overnight, and then rinse it off with warm water the next morning. (ii) Alternatively, make a mixture with 1/2 teaspoon of extra virgin olive oil and a few drops of organic honey. Apply it on your eyebrows and gently massage for 2-3 minutes. Let it stay on for 30 minutes and then wash it off with warm water. Follow either of these remedies once a day until you get the desired results. Note: Make sure to use extra virgin olive oil because it is unrefined and doesn’t contain chemicals. The juice has lots of sulfur, selenium, minerals, B vitamins and C vitamins, are very good for hair growth. They help faster and denser growth of eyebrow hair. Sulfur also strengthens the hair follicles and improves the production of collagen tissues required for proper eyebrow growth. (i) Chop a small onion. Grind the pieces into a paste and strain this to get the juice. (ii) Gently massage the juice into your eyebrows for about 2-3 minutes. (iii) Allow it to dry on its own, leaving it there for an hour. Wipe it off with a cotton ball soaked in diluted lemon juice or wash it off with a mild cleanser and cold water. As onion has a pungent smell, it is better to use lemon juice to remove all traces of the smell. Follow this treatment once daily for 1-2 months. The hair of eyebrows are made up of keratin protein, and egg is rich in protein. Egg yolk also contains biotin that helps your brows grow faster. Thus, egg yolk helps to make your eyebrows thick. (i) Break 1 egg and separate the yolk from the white part. (ii) Beat the yolk until you get a smooth, creamy consistency. (iii) Apply to your eyebrows with a cotton swab. (iv) Leave it on for 20 minutes and then rinse with cold water. (v) Apply this remedy twice or thrice a week. Fenugreek seeds contain proteins and nicotinic acid, which can stimulate hair growth. They also rebuild hair follicles, thus leading to fresh hair growth. The presence of lecithin in them provides natural shine to the hair strands. (i) Soak 1 teaspoon of fenugreek seeds in water overnight. (ii) Grind the soaked seeds into a fine paste. Apply the paste on the brows, leaving it on for at least 45 minutes. Or apply just before going to bed and leave it on overnight. (iii) Rinse with warm water. (iv) Apply this remedy 2 or 3 times a week for 2 months. Aloe vera contains a compound named aloenin that promotes hair growth. It’s chemical structure is similar to that of keratin, hence it rejuvenates hair follicles and make your eyebrows grow faster and thicker. Aloe Vera gel is non-sticky and gets absorbed fast, so it can be applied several times a day. (i) Cut an aloe leaf and extract out its gel. Gently massage the gel onto your eyebrows till it gets fully absorbed. Let it stay there for about 30 minutes, and then rinse it off. Store the remaining gel in the refrigerator. (ii) Alternatively, you can prepare a smooth paste with 1/2 teaspoon of aloe vera gel and a little honey or coconut oil. Gently massage the gel into your eyebrows, leaving it on for 30 minutes and then rinse it off with water. (iii) Follow either of these remedies at least once daily for 1-2 months to see the results. Milk contains two vital proteins known as casein and whey as well as other nutrients that nourish hair roots and improve hair growth. (i) Put a small amount of whole milk in a bowl. (ii) Soak the cotton ball in the milk, and gently massage your eyebrows with the cotton ball. (iii) Let it dry on its own and then rinse it off with warm water after 15 minutes. (iv) Follow this remedy whenever possible on daily basis to get thicker eyebrows. Lemons can also help with good eyebrow growth because of their rich vitamins C and B, folic acid contents. Moreover the acidity of lemon juice removes excess oils and helps more oxygen reach the hair follicles. This again promotes hair growth in your eyebrows. Avoid trying this remedy if you happen to have sensitive skin. (i) Simply rub a slice of lemon over each of your eyebrows for a couple of minutes. Allow the juice to be there for 20 minutes and then rinse off with lukewarm water. (ii) Alternatively, put the sliced peels of 1 lemon into 1/4 cup of pure coconut oil. Let the mixture mature for at least a fortnight in a cool, dry place. Once ready, gently massage it onto your eyebrows using a clean cotton pad every night before sleeping. Wash it off the next morning. Follow either of these remedies once daily to make your eyebrows thicker. (a) Do not leave the lemon juice on for too long as it can lighten the color of your eyebrows with its bleaching properties. (b) Do not expose your brows to sunlight for two hours after using this remedy, as it can lighten the natural color of hair. (i) Massage the hair follicles under your eyebrows daily using circular movements in the direction of the hair growth. (ii) Us a soft-bristled brush and exfoliate the skin surrounding your brows to in a while to get rid of dead cells and increase blood circulation. (iii) Break open a vitamin E capsule and apply a few drops of the oil to your brows once daily. (iv) Avoid frequent plucking, tweezing or waxing the brows too frequently. (v) Try to avoid using too much eyebrow makeup. (vi) Avoid pressing onto your eyebrows too hard while applying an eyebrow pencil. (vii) Drink lots of water to flush toxins out of your body and aid the growth of your eyebrow hairs. (viii) Stop applying any cream, lotion or other synthetic products on your eyebrows. They tend to clog hair follicles. This prevents the natural breathing process of hair and prevents your eyebrows from growing out long and healthy. (ix) Eat a well-balanced diet, specially containing biotin. Biotin is a vitamin that helps hair growth. Try to include eat eggs, avocados, salmon and peanuts in your diet to prevent hair loss. If you are scouting for fastest way to grow eyebrows, we suggest you apply a brow growth serum every day. Here we have listed for you best serums that you can use to grow your eyebrows real fast. 1. Hairgenics Lavish Lash – Eyelash Growth Enhancer & Brow Serum for Long, Luscious Lashes and Eyebrows: This revolutionary botanical serum boosts the length and thickness of eyebrows. The result is longer, fuller and thicker eyelashes and brows! Imparts sheen and luster to lashes and brows making them appear lush and beautiful. No more false lashes needed! 2. RevitaLash Cosmetics RevitaBrow Advanced Eyebrow Conditioner revitalizes thin eyebrows. It’s exclusively formulated to enhance natural eyebrows that may appear damaged from over styling or environmental effects. 92% of users enjoyed a bolder, fuller-looking brow. All you need is one thin coat during each application to really see results. 3. RapidBrow Eyebrow Enhancing Serum, 0.1 fl. oz. : This product is amplified with a breakthrough blend of fortifying proteins, stimulating peptides and nourishing ingredients formulated to help condition, restore and repair the appearance of your eyebrows in just 60 days.